The cat story began in January 2005 a few months after we moved to Colorado. Our friends, the Phelps had kittens. Starci at the time was very fond of cats, so we decided for her joy we would adopt one of the Phelp's kittens...little did we know that we would end up not being able to decide and taking 3 home instead of one. They named the kittens, Cuddles, Snuggles, and Muddles. Cuddles was adopted by Stephanie. 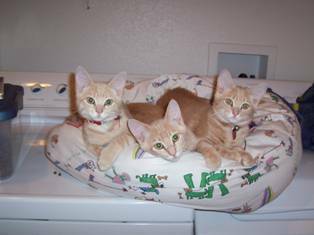 Later that summer, July 2, 2005 Snuggles and Muddles were attacked and killed by coyotes...so we ended up going to the Humane society and adopted Butterscotch and Taffy. Papa and Grannie were visiting so Grannie helped us pick the names. Taffy ended up mothering a couple litters...In the past 11 years we have lost count over how many cats have been born and sold, given away, eaten by coyotes, etc...Stephanie is the main care giver for the cats and enjoys raising the litters and have become accustomed to the lives of, "Barn Cats" Faith is the one who snuggles and loves on the kittens to prepare them for their new homes. We keep our, "Favoites" and Stephanie sells most of the offsprings on Craig's List.